A coalition of accused families and the professionals who defend them is asking for an objective scientific evaluation of today’s medical guidelines for diagnosing child abuse, specifically but not exclusively shaken baby syndrome. In November of 2010, Kristian Aspelin told emergency responders he had slipped in the kitchen while carrying 3-month-old Johan. But the child abuse expert at San Francisco General Hospital told police that children do not receive serious injuries from short falls and, further, that John’s brain injury proved he had been shaken to death. The county charged Kristian with murder. For two years, while Kristian and his wife had lost their baby, and their 3-year-old needed stability, Kristian was forced to live apart from his family while fighting the charges. In time, experts hired by the defense found compounding factors in the medical records and conducted biomechanical tests that demonstrated the fall Kristian described could cause serious injury. The county dropped the charges, leaving the Aspelins deeply in debt but reunited. So now Jennie Aspelin is helping to spread the word about the Protecting Innocent Families petition, a project that grew out of the 2013 conference for families falsely accused of child physical abuse sponsored by the Evidence Based Medicine and Social Investigation group. The petition has just gone live, on March 4. Organizers say they hope to gather signatures from 1,000 people who believe they have seen dogmatic thinking about child abuse result in accusations against innocent parents and caretakers. Dr. Hyman explains that the early child-abuse physicians, in their sincere efforts to protect children from possible violence, established a number of guidelines that entered the courtroom without being tested scientifically. Sometimes, he says, a hasty diagnosis of abuse derails what should be a thorough search for a medical condition that might produce or predispose to the same findings. He has seen physicians diagnose abuse based the presence of multiple fractures, for example, without first testing the child’s vitamin D levels. The diagnosis of shaken baby syndrome is a particular problem, the petition argues. Doctors have been taught for decades that a certain pattern of bleeding and swelling inside the infant skull proves the child was violently shaken. But now improved technology and accumulated experience have demonstrated that the same findings can also result from any of a long and growing list of legitimate medical conditions, so far including stroke, sickle cell disease, anemia, vitamin deficiencies, metabolic disorders, certain kinds of infection, and accidental injury. 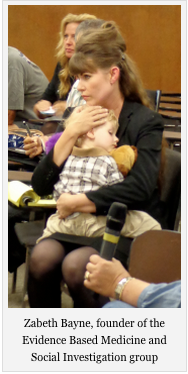 (For case examples, please see the Cases page on the Protecting Innocent Families web site). The petition, which will be submitted to the U.S. Congress and to equivalent bodies in other countries, asks for an objective scientific review of the child abuse literature, to establish which opinions are based on statistically significant research and which opinions have become common knowledge without scientific review. The petitioners suggest that the National Academies of Sciences take on the job, as a follow-up to their important and influential 2009 review of forensics in the courtroom. This petition comes from the affected families at the same time that forensics professionals are raising objections about other aspects of forensic science. For more information, please see the Protecting Innocent Families web site, https://protectinginnocentfamilies.wordpress.com/, and the Protecting Innocent Families petition, http://bit.ly/InnocentFamilyPetition. Law professor Deborah Tuerkheimer at Northwestern University has published her criticism of shaken baby syndrome in a number of academic articles as well as an op ed piece in The New York Times, “Anatomy of a Misdiagnosis,” and recently a text book, Flawed Convictions: “Shaken Baby Syndrome” and the Inertia of Injustice. For the trailer to a provocative documentary about the debate over shaken baby syndrome, please see the web site for The Syndrome. Both print and broadcast media have been raising questions about SBS diagnoses for years now, including the Wisconsin State Journal, The Washington Post, the ABA Journal, The New York Times Magazine, the Canadian Broadcasting Company, the LA Weekly, The Atlantic, The Atlanta Journal-Constitution, Seattle Met, FRONTLINE, Discover, The Chicago Tribune, and the Los Angeles Times. I’m Mark Hontz the father of 11 week old Julian James Pollack my son. The world needs to know what happen to me the police and the doctors conspired against me. Thank you for commenting, Mr. Hontz. Congratulations on successfully fighting the misguided accusations—it’s not easy, but you did it (according to the Internet).. I have sent you a private email. I didn’t see a link to sign it? Yes, I should have made it much more obvious. Keeping the legal doors open seems impossible at times and then there are the miraculous efforts of people who understand – we will never leave our innocent loved ones behind bars. Signed for Cor & James Thompson and their family. This injustice has to end. This collateral review is tragically long overdue. With collaboration efforts from doctors, lawyers, journalists and affected families, this petition is comprehensive and we pray that the message is received by lawmakers and others with clear hearts and open minds. It has been a privilege to be included in even a small way with this endeavor. Thank you all, not only for including Brian’s case but also for your tremendous efforts. Job well done everyone!